Political bickering amongst cultural opinions parallels some of the contemporary issues surrounding Brexit. A great opportunity for artists to perform with a 7-Piece rock band & 30-Piece Choir. The concert is to be performed at Hope Academy College on 7th July 2019. Cast wanted include: Young Celtic Warrior, Princess Boudicca; the mature politician warrior, wife and mother, Queen Boudicca of the Iceni Tribe. Male characters such as, anti-Romans King Caractacus & brother Togo & Pro-Roman King Cogi. Roman leader Governor Suetonius & cowardly Procurator Catus Decianus. Auditions: Weekend of 16th Feb & 2nd March. Rehearsals from 7th March (on/off) til 30th June. Co-Narrates Act 1 (with younger sister Olwen) reviewing the years AD43 - AD 61. She is the next in line to the Queen Iceni role. A noble, old-for-her-age character. Confident, mother yet warrior. Must sing duets well and wants to see how a 7-Piece band and a 30-piece choir shall enhance their performance. Sings her theme "Onward To Victory" with full company & choir. Anti-Roman, Has a henchman brother "Togo" who backs him up. They have a comedic scene across a river against pro-Roman Celtic King, Cogi. A three-way comedy song should steal the show. Catus Decianus is joint leader of roman Britain. Suetonius Paulinus is away fighting Druids and their Celtic Warriors near Chester (DEVA) and on Anglesey (MONA). 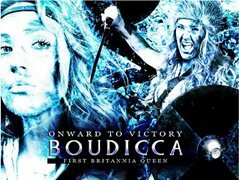 When Catus' troops torcher Boudicca & daughters, for challenging the terms of her husbands will, Boudicca gathers a huge force that destroys 3 cities and wins many skirmishes in-between. No singing in this edit but must be smug and controlling.